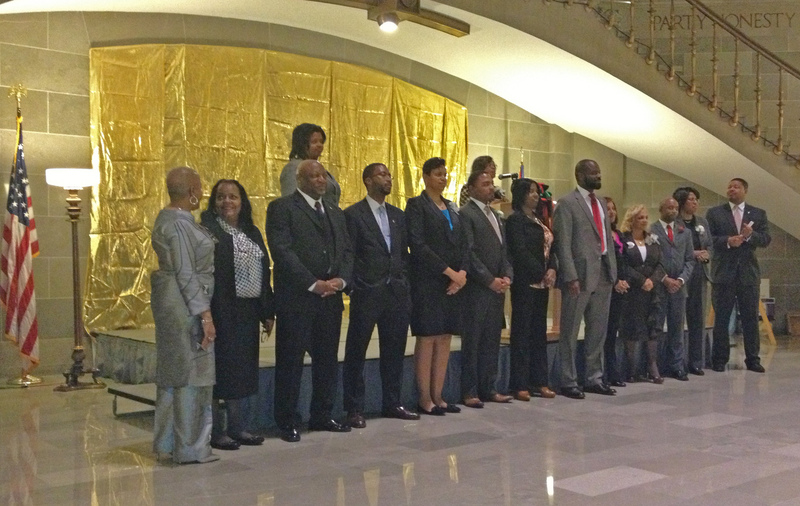 Members of the Black Caucus gathered in the Capitol rotunda to celebrate and remember the life and sacrifice of Martin Luther King, Junior, as they set their priorities for the legislative session. Reverend Freddy J. Clark from the Shalom Church City of Peace in St. Louis tells them to remember they were elected to served, and not be served. He says he thought things would change when Barrack Obama won the presidency four years ago, but it has not. Clark also asked legislators to remember that their success was built on sacrfices of those who came before them. “Just in case we forget, you know none of us have gotten where we are on our own, all of us are standing on the shoulders of somebody else,” he says. Senator Maria Chappelle-Nadal says her third great grandmother was a slave just across the river from the state Capitol, in Callaway County, a woman who was also named Maria. She reminds her fellow African American legislators how far they’ve come since then, and to never take for granted the sacrifices of their ancestors so that they could one day serve in the Missouri legislature. She also remembers a believer and visionary named DeVerne Lee Calloway, the first African American woman elected to the Missouri House in 1962. A freshman legislator from St. Louis County says the black caucus isn’t discouraged by the super-majority of Republicans. State Representative Courtney Curtis of St. Louis County says its members are instead strengthening their resolve to change their communities for the better. Members of the Black Caucus say high unemployment numbers for African Americans and a lack of healthcare benefits at jobs that are available are standing in the way of success in black communities … and that lack of educational opportunities are another obstacle keeping African Americans from getting good jobs. The Black Caucus says this session it will focus on improving educational outcomes in black communties, putting more people to work for fair wages and health benefits, and expanding Medicaid.